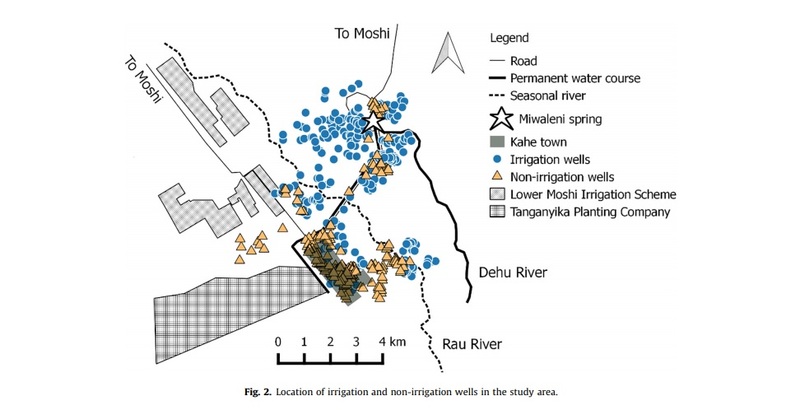 New research on irrigation and water resource use near Moshi, Tanzania, has been published by REAL team member Dr. Chris de Bont (Stockholm University, Sweden) in World Development! de Bont C, Komakech H, Jan Veldwisch. 2019. Neither modern nor traditional: Farmer-led irrigation development in Kilimanjaro Region, Tanzania. World Development 116, 15-27. The debate around what kind of irrigation, large- or small-scale, modern or traditional, best contributes to food security and rural development continues to shape irrigation policies and development in the Global South. In Tanzania, the irrigation categories of ‘modern’ and ‘traditional’ are dominating irrigation policies and are shaping interventions. In this paper, we explore what these concepts really entail in the Tanzanian context and how they relate to a case of farmer-led groundwater irrigation development in Kahe ward, Kilimanjaro Region. For our analysis, we rely on three months of qualitative fieldwork in 2016, a household questionnaire, secondary data such as policy documents and the results of a mapping exercise in 2014–2015. In the early 2000s, smallholders in Kahe started developing groundwater. This has led to a new, differentiated landscape in which different forms of agricultural production co-exist. The same set of groundwater irrigation technologies has facilitated the emergence of different classes of farmers, ranging from those engaging with subsistence farming to those doing capitalist farming. The level of inputs and integration with markets vary, as does crop choice. As such, some farms emulate the ‘modern’ ideal of commercial farming promoted by the government, while others do not, or to a lesser extent. We also find that national policy discourses on irrigation are not necessarily repeated at the local level, where interventions are strongly driven by prioritization based on conflict and funding. We conclude that the policy concepts of traditional and modern irrigation do not do justice to the complexity of actual irrigation development in the Kahe case, and obfuscate its contribution to rural development and food security. We argue that a single irrigation technology does not lead to a single agricultural mode of production, and that irrigation policies and interventions should take into account the differentiation among irrigators. Komakech HC, de Bont, C. 2018. Differentiated access: Challenges of equitable and sustainable groundwater exploitation in Tanzania. Water Alternatives 11(3): A11-3-10. de Bont, C. 2018. The continuous quest for control by African irrigation planners in the face of farmer-led irrigation development: The case of the Lower Moshi Area, Tanzania (1935-2017). Water Alternatives 11(3): A11-3-22.